We have had 12 Spies Vineyards & Farms Anniversary Party on our calendar for several weeks. 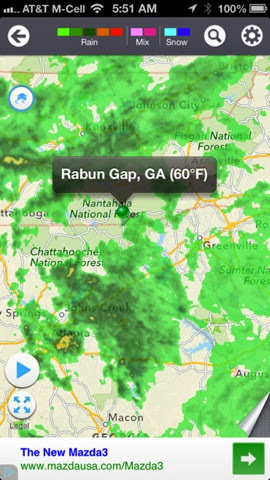 As Saturday’s outdoor event grew closer, the weather forecast did not look promising and it was indeed pouring rain here in Sautee as we loaded the car to head north to Rabun Gap. Really, I guess we shouldn’t be surprised it was raining. Rabun county has the title of the rainiest county in the state of Georgia, with average rainfall of over 70 inches a year. Regardless of the weather, we were going to be there. When we commit, we follow through, and the event was advertised as rain or shine. Things always seem to work out for us though. We have had a new product ready for about 2 weeks now but have been waiting on labels for it. We had hoped they’d be done in time so we could debut our third product at 12 Spies. It wasn’t looking like we were going to get them in time, but then, we got shipping notice and not only did they arrive in time, they arrived on the Monday before the event so it wasn’t a week of wondering if we’d be bring Vineyard Fire with us. It was going to happen! Vineyard Fire is our newest and spiciest pepper spread. Using plenty of spicy jalapenos and blending them with sweet Chambourcin wine, Vineyard Fire stands up well on an appetizer plate with creamy goat cheese and roasted pistachios, almonds or walnuts. So with Vineyard Fire, Chambourcin & Georgia Apple Cider spread on board, as well as jelly roll cakes & other goodies for tasting, we were in the car hoping for a break in the weather. When we got to the vineyard, there was a flurry of activity with everyone working to get set up for the day. 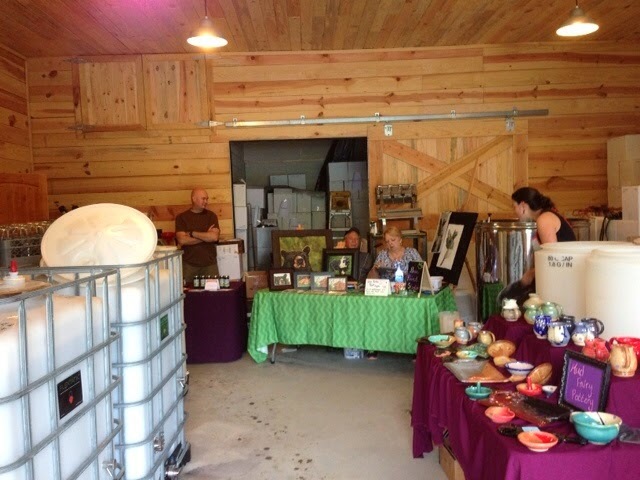 Lisa and Mike were very considerate and thoughtful of all the vendors who came up for their celebration and instead of having everyone set up EZ-Ups in the field, we were all inside and Unicoi Preserves was blessed to score the best possible location for jelly sampling — in the winery tank room right in front of the lab sink! It was absolutely perfect for us with access to hot running water, soap and towels! 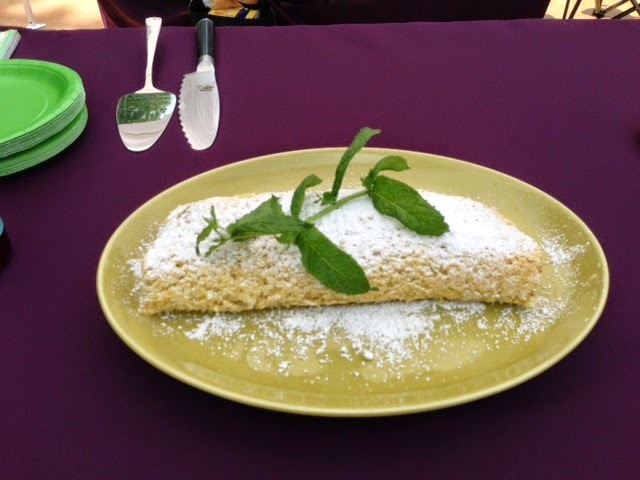 Serving jelly roll cake, cream cheese, crackers and jelly can get a little sticky at times. We met some really nice and interesting people, to include a man retired from the FBI, and some people from as far away as Houston, TX and California. In addition to new friends, we were so happy to see some of Clark’s family that live in Tiger. Technically, Clark said they aren’t family, but we all talked about and agreed, when you marry into the Neal family, you are part of the Neal family. Towards the end of the day, our friends Chris & Sarah came by to do a tasting and see the vineyard. 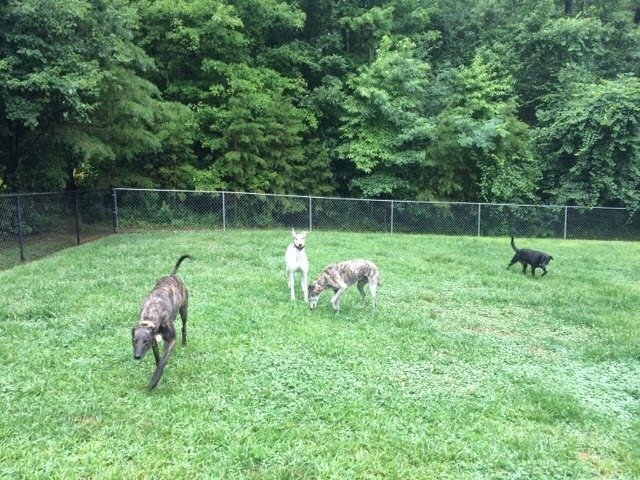 Awesome friends, not only did Sarah & her girl Lucy visit & give our greyhounds a turnout before coming, they helped us load out quickly so we could get home and get ready for Sylvan Valley Lodge’s dinner with Habersham Winery. Things always work out, you just have to Believe. Have you ever noticed that it takes forever for the second in a series of books or movies to come out? Well, suffice it to say, sometimes blog posts are the same way. After a good night’s sleep at Ashley & Frank’s home, a healthy, home-cooked breakfast & coffee, I was out into the world to reconnect with friends and family throughout the area. My first stop of the day was to visit my beautiful friend Anissa. It was an exciting day for Anissa and her husband Mark, as they were filming a new tv commercial at their office in downtown Albany. They’ve done extensive renovations to bring an older home back to its glory. After visiting for a bit, meeting their staff and vowing to not let so much time go by without reconnecting, I left. As I was leaving, I drove around the block and went back. I had forgotten to take a picture with Anissa, so I parked, went in and we had a fun time hamming it up in front of their office. In 9 out of 10 photos, I will have my eyes closed. Next on the agenda was a trip out to Lee county to see Tiffanie, Vonnie and Cadence. 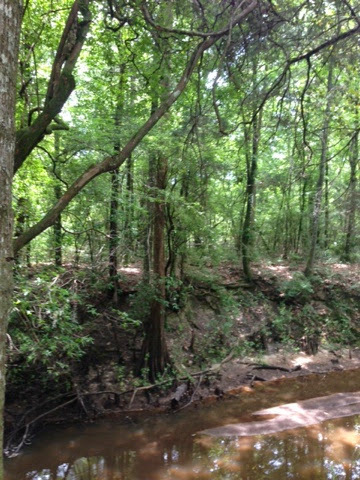 They had sold their home in town and moved further out to a great new home in the country with access to the creek. So quiet and peaceful. Driving out to their home on all the roads we used to ride road bikes on together, I had so many memories of times spent there and wished I had my bike with me. Next time! 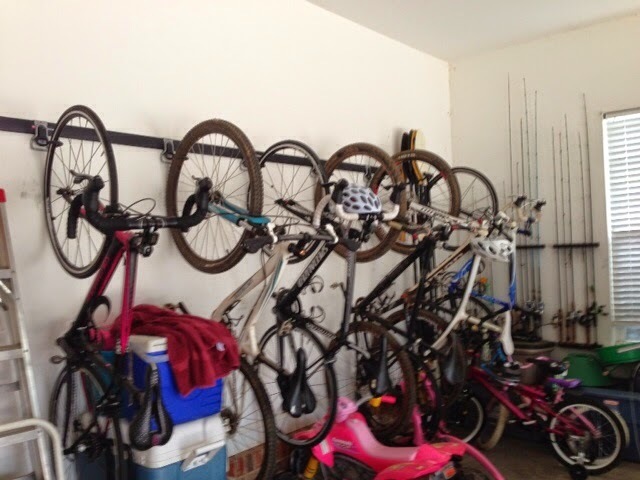 I could take a similar picture in our garage. We actually have that same rack. Third stop of the day was to see my sis-in-law and family. They are such a high energy bunch with so many things going on, so I was glad I could pop in and visit. At that point, I was running out of time but being the optimist that I am, went back and picked up Ashley and Frank and headed out to Arlington to StillPond Vineyard. In total bad form, we arrived at their tasting room about 15 minutes before closing time. The ladies in the tasting room were still very gracious and we did a tasting and bought some wine to bring home. The distillery is new and the still is gorgeous! By now, I was out of time for visiting friends and actually late to my reunion. Whoops! However, as perfect timing would have it, I may have missed the initial showing of old pictures from high school, but I was just in time for dinner. 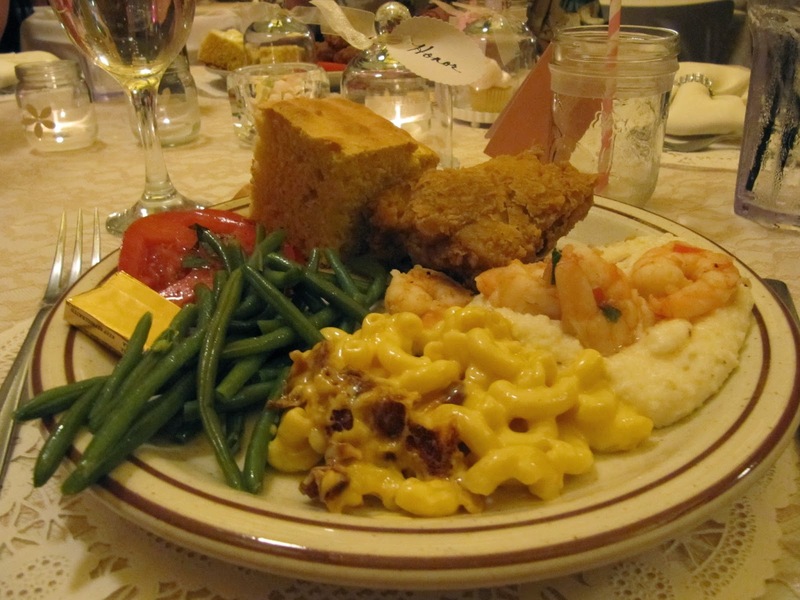 It was a great southern spread that included fried chicken and sweet tea. Two of our high school teachers were there as well as the assistant principal Commodore Conyers. He would always call school assemblies to order by saying “Young people, young people!” and he gave us all a thrill when he walked up to the podium that night and addressed us that same way. Good memories for certain. Sunday morning my internal Fox alarm went off early, so I said my good-byes to Frank and Ashley and headed north. Knowing I’d be driving right through the Atlanta area, I didn’t want to miss a chance to visit with my favorite sister, so I called her in route and we had a good visit over lunch. I had no more stops in mind, I was ready to get home to my family. 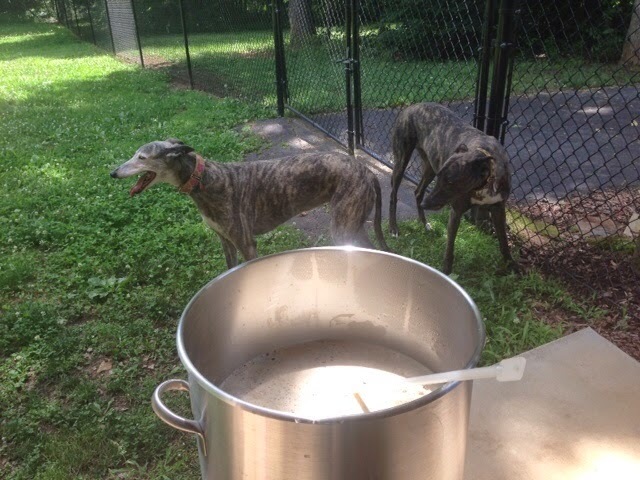 Came home and discovered Clark and the greyhounds enjoying some outdoor time brewing beer. It was a whirlwind of a weekend. I can’t wait to do it all again. Soon. This upcoming December, we will celebrate six years as full time residents of White county. Our lives are very active and it seems there’s always something going on here, so we don’t go back to visit friends and family very often in south Georgia. This past weekend was my thirtieth high school reunion so I made the trek south to Albany. On the way down, I stopped on the square in Covington, Georgia and delivered some of our spreads to the Cork Boutique and Gifts. Such a beautiful shop, filled with gourmet foods, gifts and wine. 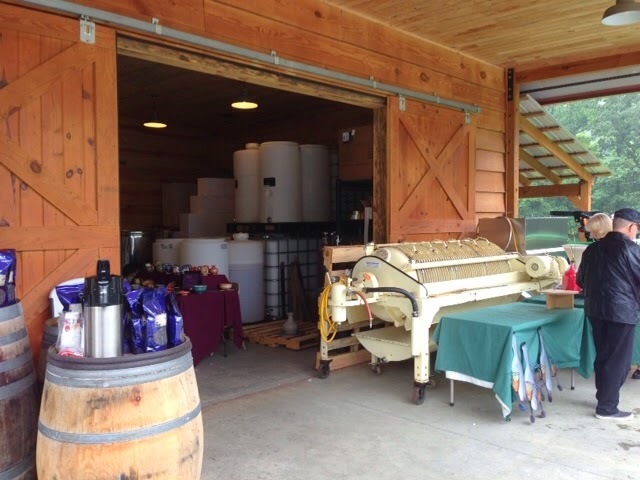 They were getting ready for a tasting with a large group and the weather was starting to change for the worse, so after spending a little time there, I was soon on the road heading south, courtesy of Apple Maps. You may not know this, but despite being in the transportation business forever, I am directionally challenged. Having Apple Maps on the iPhone is really great because it talks to me and gives me turn by turn directions. And, if something happens and I miss a turn, it will reroute me. Brilliant! Heading south of Covington, I was enjoying the two lane country roads when the weather got really, really bad. It was raining so hard that the wipers couldn’t keep up and I was thankful to be on a country road instead of I-75. I slowed down my speed and continued, weather breaking occasionally. As I was traveling and getting close to Gray, Georgia, the rain slowed, and the wind was weird, kind of swirling. I looked to the right in the direction I was traveling and I started to see clouds drop down towards the ground. I don’t know if I’ve ever been so scared on the road but I turned down the radio and just started praying out loud, put my hazard lights on and accelerated into the left lane. The car I had been following had slowed down, but I was not planning on sticking around to get sucked up by a tornado. Thankfully, I made it past the storm area and was soon on I-75 heading south. I was pretty rattled at that point but as I headed south and the weather cleared, I was soon at exit 99 for Albany. I have never been a person who forgets to eat, but I did realize I had not stopped for lunch and it was actually approaching the dinner hour, so as I came up on Striplings, I knew exactly what I was having for dinner. When Clark and I would travel from Albany to Sautee, we would always stop at Striplings for a sausage dog, chips and a drink. We did it so often for so many weeks in a row, we called it our Friday night date. I was a little lonely eating my sausage dog by myself (Clark was at home dog wrangling and didn’t make the trip south) but I enjoyed it nonetheless. I finally made it to Albany and arrived at Ashley and Frank’s beautiful home where I was greeted by a terribly happy Kelsey and Mason. I always joke that I never stay anywhere that doesn’t have a resident greyhound and once again, this proved true, and times two! I’m a big boy but I don’t like the thunder-boomers! Friday night’s get together at Austin’s Firegrill was a nice reconnection with so many familiar faces. We all agreed, we all look better now then we did in high school. After the get together started breaking up, I headed back over to Ashley & Frank’s. Apparently, the bad weather had followed me south and we had a pretty big thunderstorm. Poor Mason was really stressed out, he has a true storm phobia. I know he was glad to have us there and for the chatter to distract him, but I really felt bad for him. We stayed up later then any of us usually do and enjoyed some cocktails. I was quite surprised to roll over Saturday morning at 8 o’clock — the Fox alarm never allows such luxury at home! Spring is here, the season of rebirth. Watching the forest change, with ferns coming back and trees greenery filling in is always awe-inspiring. This spring, we are especially thankful our grass seed has taken off. 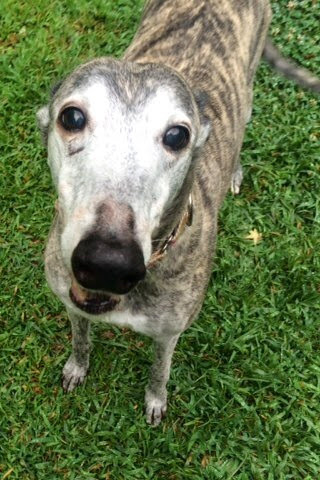 The cycle of rain and snow resulted in a red clay backyard and three unhappy greyhounds. But, like I said, Spring is Here and we started celebrating. 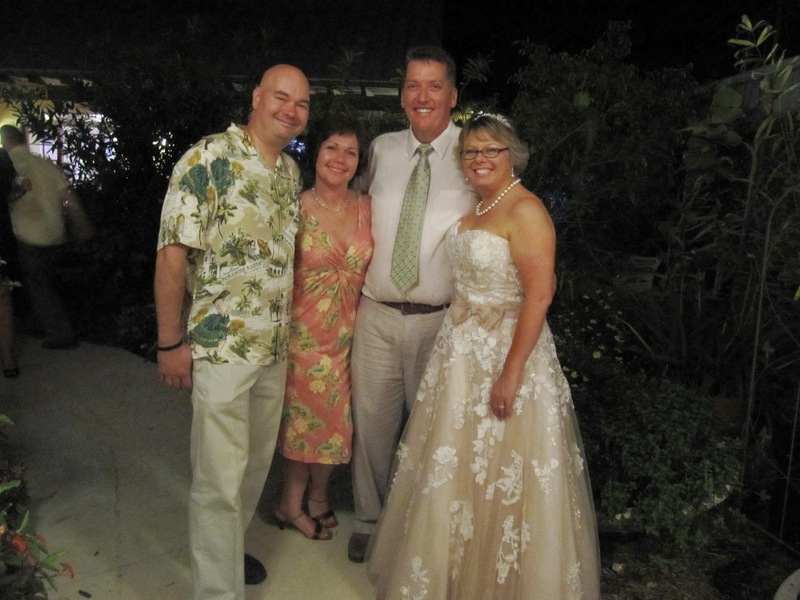 May 24th we celebrated the first anniversary of Serenity Cellars with Joe and Tina Smith. Driving down the hill to the winery, you are transported from White County, Georgia to Tuscany. Walking into the tasting room and being greeted by its old world charm puts you in a different frame of mind. One of our favorite ways to spend the day is drinking a bottle of Traminette and listening to local musicians on the piazza. We are blessed to live in an area filled with great musicians and Joe had a full day scheduled to include Jeremiah Osterman, Teddy Baker and Tom Connor. Their piazza is set up with comfy wrought iron chairs, tables and umbrellas that are surrounded by showy roses and landscaping. 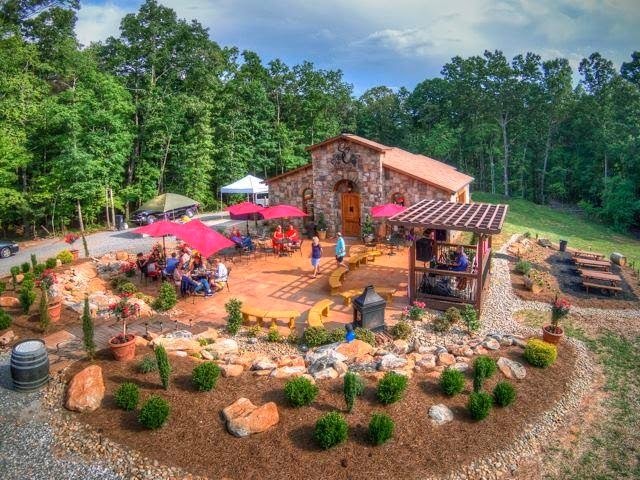 Looking over the vineyard at Mount Yonah, you realize that the vision Joe and Tina had to put the winery in that particular spot was absolutely right. We set our EZ-Up up early in the day, and brought along some new pairings to highlight the flavors of our spreads. The weather was ideal for being outside, sunny with an occasional breeze but nothing as brisk as to make us worry about staking down the tent. So many friends were there to celebrate the anniversary, such is the close-knit community we live in. The late afternoon speech by local folk legend Harold Bryson made everyone feel the love that we all have for Serenity Cellars and Joe and Tina. We are happy for their success and wish them all the best. 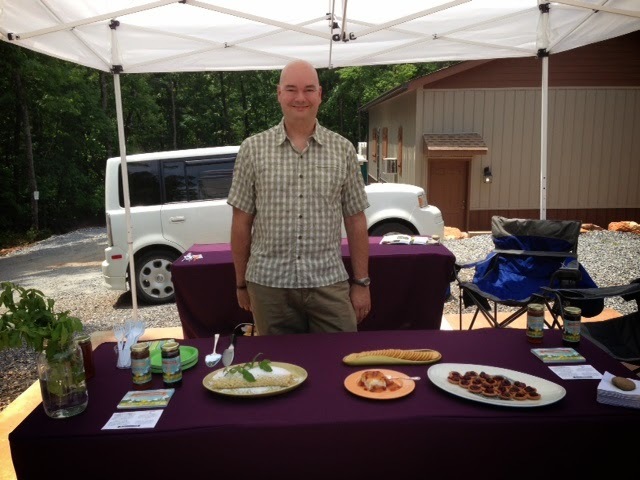 Saturday, May 3rd was our product debut at Habersham Winery. There were a few details that had to happen that were outside our direct control, so the week leading up to WineFest, Clark & I were both feeling a bit concerned. However, lady luck smiled upon us as she so often has, and we had jars of our spreads to sample and sell that even had labels on them. Speaking of labels, the beautiful graphic design and consistent branding our company has is the work of my sister, Betsy Lescosky. We are a truly honored to have her work and input. Yay Betsy! Habersham Winery has been very kind to us and has supported our venture from the beginning. They listened to our ideas for products and were willing to taste test multiple batches through the winter months to help us dial in the flavors we were after. Getting ready for WineFest, Clark purchased an EZ-Up and we put it up in our driveway to make sure we/me understood how it worked (Clark knows how to do most everything). We basically set up everything we would need to sample and sell and made a list. Then, looked at it, made some changes, and added to the list. Admittedly, I was a bit nervous about the whole EZ-Up thing, but transitioning from a City Person to a Mountain Woman, I can handle putting up a tent that is called EZ. Emily DeFoor at Habersham Winery set us up for success, though and we didn’t even need the EZ-Up. 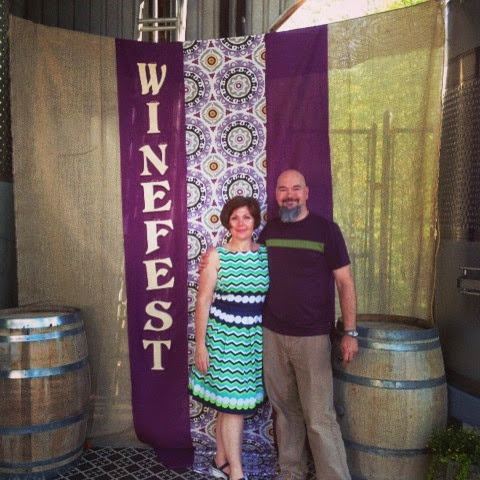 We set up inside the winery’s tank room, and the thing that was only a little bit of a challenge was getting our 8 ft. banner stretched out and hung straight enough to pass the winemaker’s critical eye. However, Andrew deemed it “Good Enough” and we were open for business. The day started out with a big surprise. Clark’s parents had driven up from South Georgia to be there in support of us. Clark’s mom is very supportive and loving but was quick to tell Clark and anyone else who would listen that he needed to get rid of that beard. Many of our friends came out in support of us (and of course to drink wine from the 15 wineries that were there) and it was an emotional day to see how many people really liked what we cooked. Its a true compliment to a person that cooks when someone likes your food. We left Habersham Winery very humbled and appreciative of so much kindness shown to get us off the ground. This year, the winter seemed harsher and longer then usual. But suddenly, everything is green and lush, which means that spring is here and we are getting local vegetables once again. We support a family of farmers in southern White County, the Cook’s, at Cedar Hollow Farm, by subscribing to a weekly share program. We got to know them by going to the weekly So Called Farmers Market at the Sautee-Nacoochee Center. The Cook family always had unusual vegetables and beautiful flowers, so when we went a few years back and noticed their absence, we asked Steve of Steve’s Famous Greens, where the family was. He told us they started a weekly subscription plan and wouldn’t be coming to market any longer. Disappointed but excited, I was able to reconnect with Carolyn and we have been members of their subscription plan ever since. Every Tuesday, we get to ride out to the Cook family’s land and pick from what they picked earlier in the day. Its great because if there is something one of us doesn’t like (Clark won’t eat beets, I’ve tried! ), there are plenty of other freshly picked things to choice from. May starts out with greens. Kale, several varieties of lettuce, spinach, mustards, green onions, leeks, tatsoi, radishes, sugar snap peas, garlic scapes, beet greens, beets, broccoli, basil and other herbs. Winter salads just don’t do it for us any more so we have been making up for lost time and have been eating like rabbits since we started farm pick up two weeks ago. We try to buy foods as locally and minimally processed as possible and have eliminated eating things like commercially produced salad dressings. When I look at labels and don’t know what ingredients are, or even how to pronounce them or see high fructose corn syrup or sugar as a main ingredient, more times then not, I will put them back. Oil and vinegar are my usual choice for dressings because of this, but sometimes, I miss the complexity and flavors that a bottled dressing has. 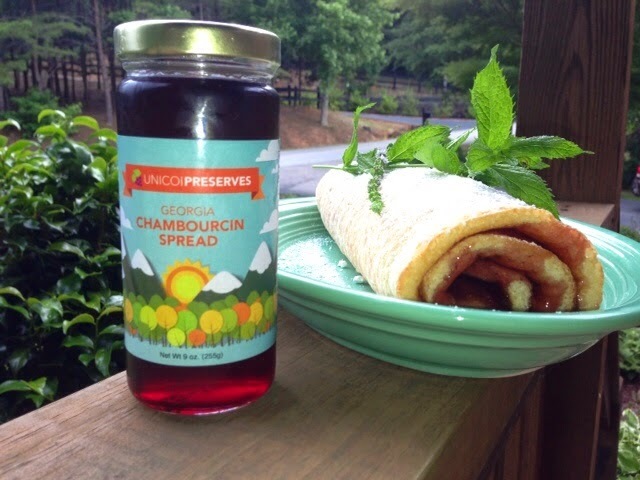 Today, I experimented and came up with a new vinaigrette using our Chambourcin Spread. Since our spread is low in sugar, its light sweetness mixed with the acidity of the vinegar makes for a fantastic and flavorful dressing. Here I use it over my mixed green salad with goat cheese, scallions, pecans, topped with my sister Betsy’s Pickled Sweet Cherries. In a small bowl, whisk Chambourcin spread, red wine vinegar, garlic and rosemary until combined. Add olive oil, a few grinds of black pepper and a pinch of salt. Whisk til smooth. If rosemary isn’t your thing, try it with fresh basil or mint. 22 May What’s this all about, anyway? We have had lots of questions asked of us since we started this new journey – “Why?, I thought you had a job already?, What made you do this?” are a few of the ones that come up regularly. Honest questions, that sometimes we even ask ourselves. I had a bit of time to sit and reflect yesterday evening as I was waiting on the coals to get ready on our trusty Weber Kettle grill. What was for dinner? I’ll get to that in a bit. It was a beautiful Spring eve here in the North Georgia mountains, and I had just finished cutting the grass, so I grabbed a beer and lit the grill and decided I would just sit and stay a while outside. We had the good fortune to relocate here to our little slice of heaven 5 1/2 years ago. We got a chance to do what many adults don’t get to do. We packed up and moved to the mountains, bringing our jobs with us and pretty much starting over. We left our great network of family and friends behind in South Georgia and decided to start anew. It was a daunting but exciting proposition. We would get to choose who and what we wanted to be associated with and how we wanted to devote our time to things that interested us. Not many people get the chance to start fresh, but we decided it was worth a shot. We found many new friends here that opened up their hearts and homes and made us feel welcome. We discovered new places to call ours, and along the way, we developed a deep sense of belonging and community. We discovered a way of life most have forgotten. Connecting with local growers and providers, getting to know the hands that provide the food we eat, and the wine that we drink. The more we discovered, the more we felt connected to our little community. Out of this connection and desire to eat and drink as locally as we could, we started canning and preserving some of our favorite seasonal treats so that we could enjoy them all year, not just when in season. 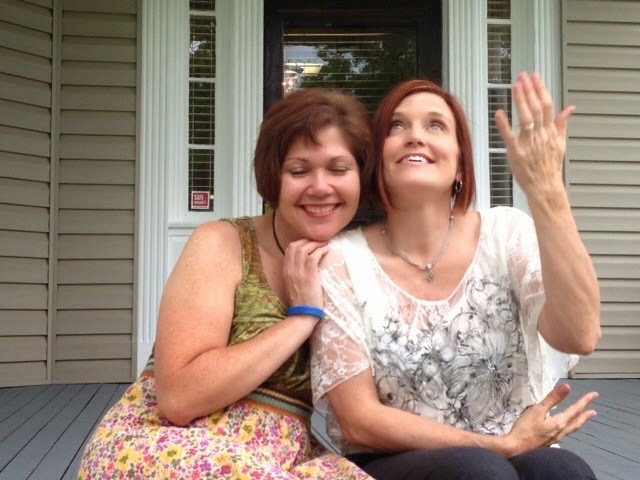 As we did this more and more often, we decided we wanted to share with others what our community had shared with us. 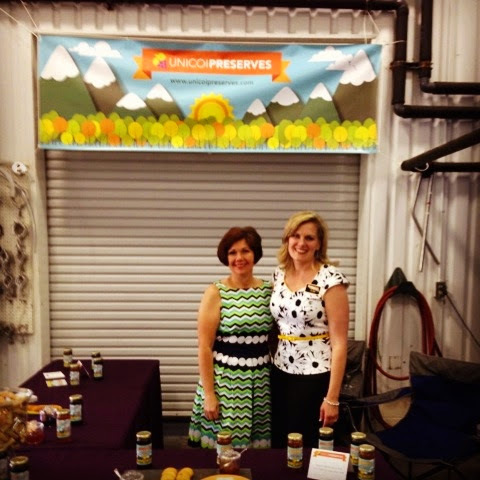 So, we started Unicoi Preserves to share our passion with others. Because it takes a lot of experimentation to dial in a final recipe that we want to produce for others to enjoy, that means we have LOTS of test batches to figure out what to do with. You can only give so many jars to people before they start to eye you suspiciously when you approach them with a little brown bag of jars. So, back to last night’s dinner. Our trusty Weber Kettle grill is special. It was a pre-wedding present given to us 18 years ago at our couple’s wedding shower. I don’t use it often, but every time I do, it brings back fond memories. 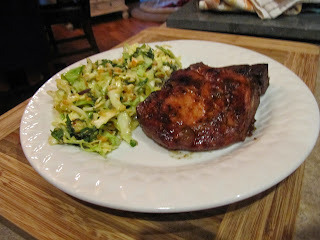 Last night, I grilled bone in pork chops that I brined and then smoked with apple wood. I brushed the pork chops with our Georgia Apple Cider Pepper Spread during the last few minutes of cooking over direct heat to form a glaze. Suzy made slaw, and dinner was done. I told you we have to get creative to use up all the excess fruits of our labor! After all, this venture grew out of our love of local food and wine, and heck, everyone has to eat! I met Fred many years ago on a bike ride down in Albany. We were on a club ride and he was new in town. Clark wasn’t on the ride that Saturday morning when I had a flat tire. Being the nice guy that he is, Fred happily stepped in and changed it for me. I went home talking about this nice fella I met on the ride, how he had helped me out by changing my tire and wouldn’t even take a tube back in return. We started to become friends and Clark started having a little Spidey Sense Tingle going on. Who is this guy Fred and why is he being so nice to my wife? Suddenly, Clark start riding again. Before long, we were all the best of friends. There were many nights of beef and beer on our back deck with Ri and the greyhounds, long bike rides with Fred’s top secret recipe chocolate chip cookies, general shenanigans and rojos at Harvest Moon. Happy times for The Three Amigos, but never the right lady for Fred. Duty called and Fred moved south to Florida with his company. He’s such a smart worker (“Work smarter, not Harder”) and dependable. His bosses knew if they needed him to relocate, he would do it with a smile. We stayed in touch and when we were buying our home in Sautee, Fred, being the Super Nice Guy he is, took time off from his job, drove up from south Florida and helped load and drive a moving truck from Albany to the mountains and unload it. Then got up the next morning and helped us paint the entire inside of the house, all over the course of a weekend. The kicker was, at the end of that weekend, after we dropped the moving truck off in Gainesville on the way back to Albany, he picked up his car at our home there to head back south and thanked US for a good time! Fast forward a few years. Back down in south Florida, we kept hearing about this Tammy. And then one Thanksgiving, Fred & Tammy and family in tow came to the mountains. We met this super cute Princess and kept our fingers crossed that the stars would align for our friend. When we got the word that he had Asked and she said Yes, we were thrilled and thought May 17th would never arrive. Their wedding day was perfect. Florida sunshine with a breeze and no humidity. Someone remarked at the wedding, when two people are meant to be together, the weather always shows. Fred and Tammy will begin the next chapter of their fairy tale in North Carolina and we wish them a lifetime of happiness. Somebody has to go first, right Scott? Everything happens for a reason. Sometimes you just have to just let go and Believe. 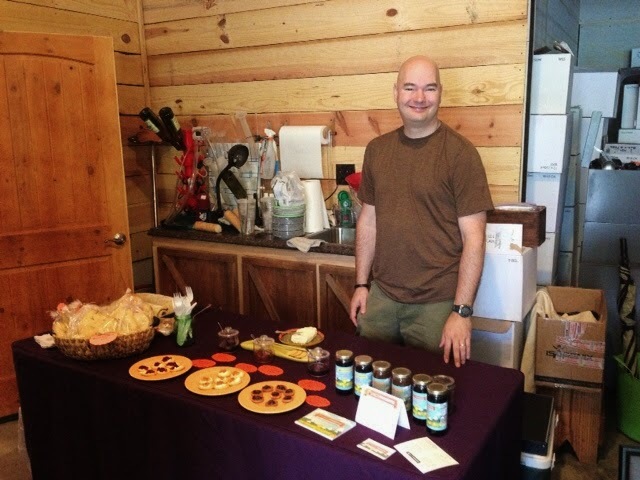 This past Saturday we spent inside Habersham Winery’s tasting room doing a product demo after being cancelled by an outside art festival. Neither Clark nor I were upset about that cancellation, somehow it just didn’t feel right. But, since we are a new company, we figured the exposure would be good. A good deal of our weekend time is spent at local wineries, not art festivals, but we’re flexible and had nothing to lose. So when Emily asked if we wanted to set up inside the winery tasting room, it was pretty much a no-brainier. 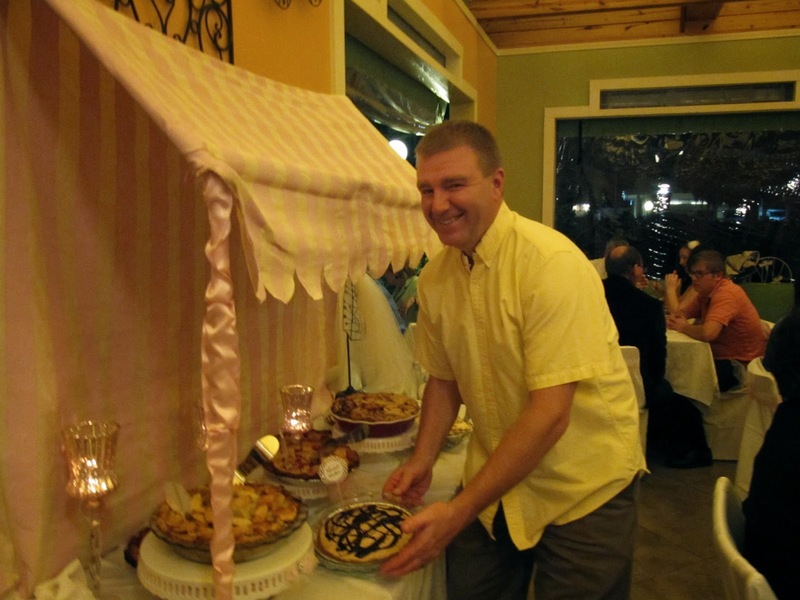 Setting up a table inside Habersham Winery > then hauling an EZ-Up & spreads through a wet grassy field. 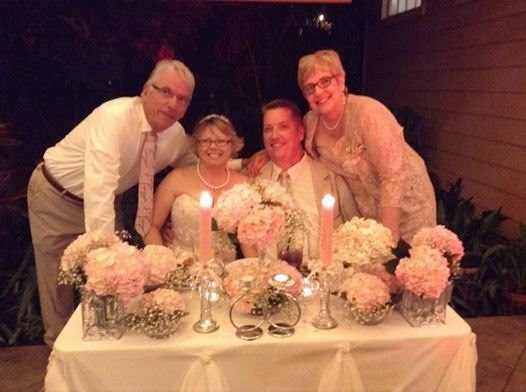 Emily, Andrew & the entire staff of Habersham Winery are some of the most gracious people we know. They have supported us in so many ways. Oh and did I mention, we love their wines? 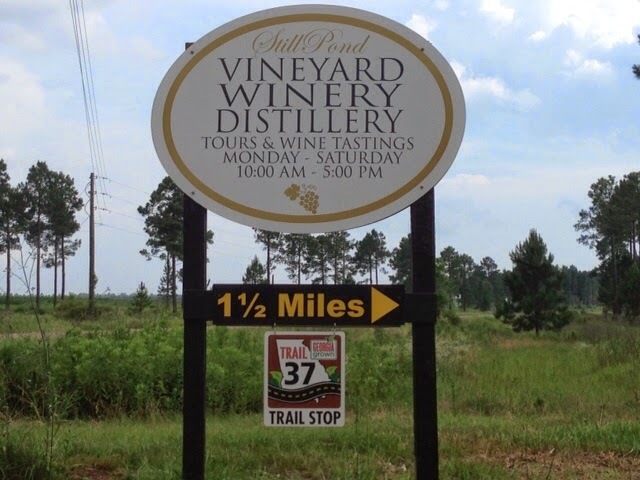 We have a very good community here in North Georgia Wine country & love living on the Unicoi Wine Trail. Some of the friendly folks we met the previous Saturday at WineFest came back to Habersham Winery & brought friends visiting from Arizona to do a tasting. 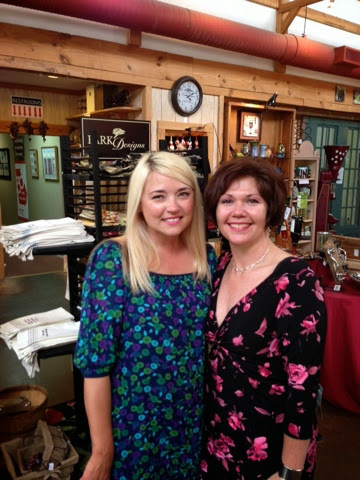 We had met several people Friday night at Serenity Cellars, while listening to Monica Spears. 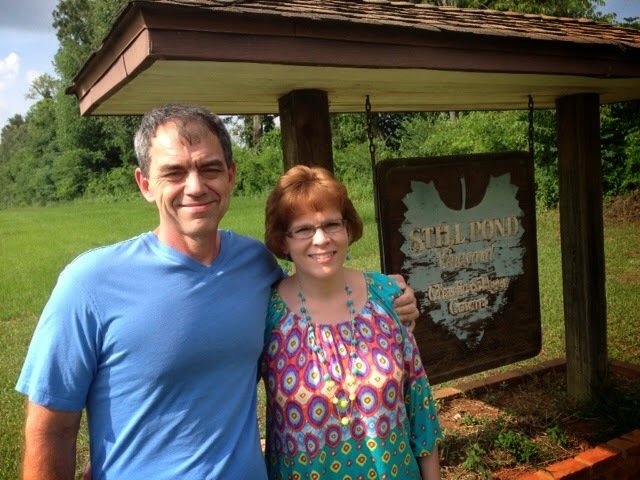 They were all staying at Sylvan Valley Lodge. Ginevra & John are bringing their lodge to a new level, with a new event space. I also just saw something about a Mountain Beach Party there May 31. To top it off, the okra, on top of the jar, so to speak, we had the pleasure of meeting a real-life Athens, GA food celebrity, Angie Tillman of Phickles fame! I know I was probably gushing and too excited, but dang! 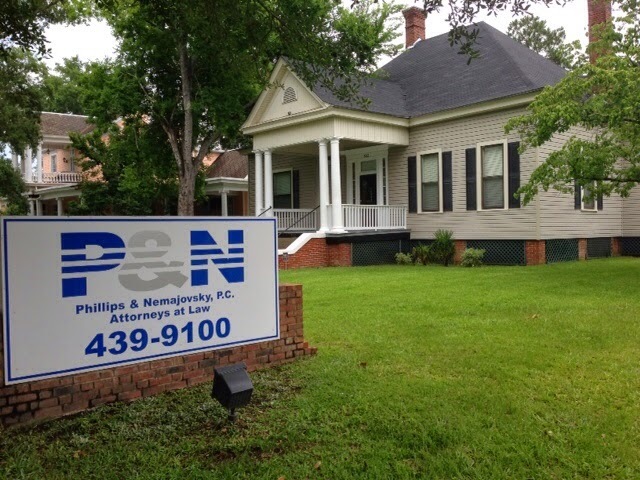 Angie & Phin have worked so hard to take their business where they have. 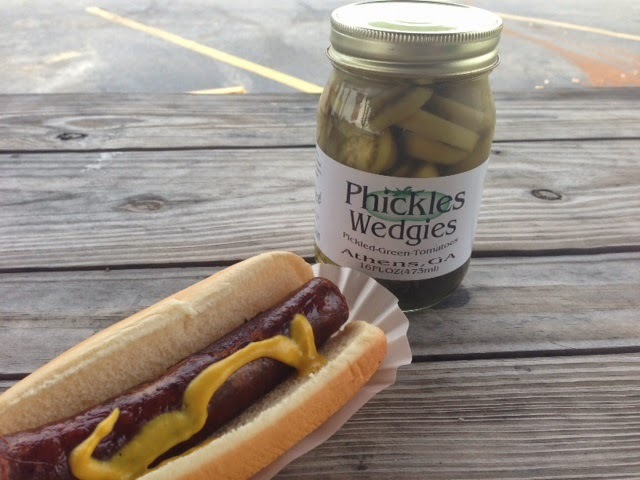 Their Phickles are super yummy and healthy. Plus, they were just so genuinely nice & shared some advice. Best advice she had? Mother’s Day has been bittersweet since my mom’s passing. Growing up, she and I didn’t always get along. I was independent from the time I could dress myself. Being a child in the 70’s meant that plaid pants & a tie dye body suit was an outfit, at least in my mind. She let me go with it though & throughout my childhood, was there for me and my siblings. Cupcakes in ice cream cones for the school bake sale, funnel cakes in an electric skillet at the school fair, potluck dinners at Camp Osborn Boy Scout camp. Too many activities really to mention but she was always ready to go and be there, even if it was outside her comfort zone. The only way she enjoyed being outside was at the beach or in their swimming pool. My love of the forest did not come from her. Clark & I knew we were in big trouble a few years back when I crashed my mountain bike & dislocated my shoulder. I waited a few days before calling to tell her, and might have popped a pain pill before I did dial her up. Not much sympathy, more or less a scolding over the phone, “Little girls shouldn’t play in the woods!”. 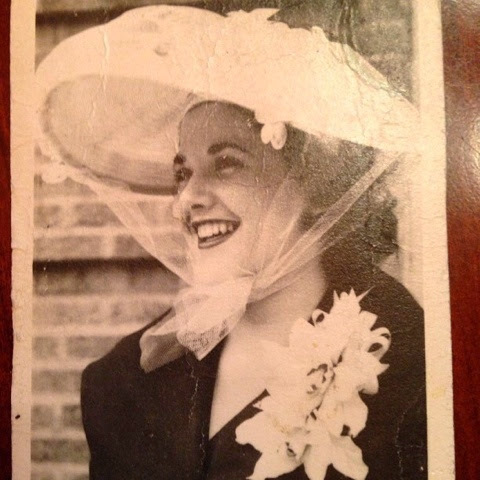 My dad died a year before she did and this is the picture of her he kept in his wallet for 51 years.